In 1939, Richard Perry travelled to Lundy to study seabirds. His work, along with the work of Ronald Lockley, initiated a new era of seabird research (Gaston and Jones 1997). Although some of his conclusions have been challenged, Perry's observations of Lundy's auks and Kittiwakes remain a useful baseline for current studies. As the 75th anniversary of Perry's research approaches it is perhaps a good time to return to his work and to the work of other researchers who have been drawn to the Isle of Puffins. Ronald Lockley criticised Perry's counts of breeding seabirds. 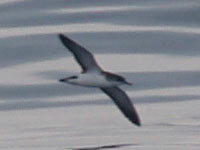 In particular, Lockley questioned whether there were 1000 pairs of Manx Shearwaters breeding on Lundy. Alexander, W.B., Southern, H.N. Tucker, B.W. & Watson, J.S. try to answer this question during a short visit to Lundy. With the formation of the Lundy Field Society, Lundy became a Bird Observatory. Annual ringing of seabirds. Barbara Snow (nee Whitaker) was the first to study the breeding behaviour of European Shags in any detail. This research lead to major papers in Ibis and British Birds. Hugh Boyd analysed the results of the first 10 years of seabird ringing. Jeremy Greenwood studied first flighting in Common Guillemots and Razorbills. He followed this research with work on Handa, Sutherland. A paper combining the results of these two studies was published in Ibis. Although hampered by the lack of a resident warden, Lundy Field Society volunteers (including Bob Britton) complete a seabird census for Operation Seafarer. Tony Taylor studied the interactions between Common Guillemots and the larger gulls. Lundy loses its status as a Bird Observatory. Martin Davies started long-term census work by establishing seven study plots. His work was continued by Neil Willcox and David Price. This study has evolved into an on-going 4-yearly census of the whole island organised by David Price and Helen Booker. Dr Denver Daniels studied behaviour and communication in the Black-legged Kittiwake. The University of Exeter begins annual field trips to study Animal Behaviour. Tim Birkhead and Ben Hatchwell conducted two small projects on Lundy to complement their long-term studies of Common Guillemots on Skomer. Tony Taylor starts ringing studies of Manx Shearwaters. Richard Campey starts a survey of Atlantic Puffin numbers. With the continuing decline in Atlantic Puffin numbers, the question of Rats and Seabirds becomes prominent. Animal Behaviour studies and census work continues. Sea Empress disaster affects Guillemot numbers. Current studies focus on the Seabird recovery project, a joint venture of Natural England, RSPB, National Trust and Landmark Trust. Atlantic Puffin and Manx Shearwater studies are increased. David Price and Helen Booker conducted a taped-call response survey of 7000 potential Manx Shearwater burrows in 2001. Poor breeding performance of seabirds in the North Sea leads to increased monitoring of Common Guillemots and Black-legged Kittiwakes on Lundy. The Seabird Recovery Project, a partnership between Natural England, the RSPB, the Landmark Trust and the National Trust began in 2001 and aimed to increase Manx Shearwater numbers on the Lundy to provide an insurance policy for the species as a whole. In 2005, the first Atlantic Puffin chick was seen since 1972, and there has been a slow increase in breeding pairs (6 pairs in 2008). There has been a three fold increase in occupied Manx Shearwater burrows, and successful breeding has been recorded in every year since 2004. Common Guillemots disperse to sea after breeding where they become flightless during their pre-basic moult. Breeding birds at the south of their European range make brief visits to their breeding ledges from October onwards. 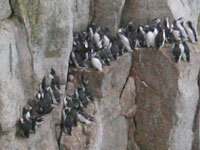 On Lundy, the earliest sighting of Guillemots on breeding ledges was of 40 birds on the 7th Nov 1994. This study, which is concentrating on 7 sub-colonies between Needle Rock and St Mark's Stone, has found 70 Guillemots on 27th October and regular counts of over 400 birds from 12th November. Lundy's cliffs have many names, named by the different groups of people that have worked and played on the island over the years. Aztec Bay appears in Michael Williams' " The Lundy Companion" as "a small bay on the West Side between St. Mark's Stone and St. Philip's Stone". To the climbers that visit after seabirds have left, the same bay is formed by St. Mark's Stone, the Parthenos, Grand Falls Zawn, Double Headed Zawn (formerly Langham's Cavity), and Beaufort Buttress. In addition, the Northern Gannet bred successfully until the North Lighthouse was built in the 1890s. The Great Cormorant used to breed in small numbers. Ringing studies on Lundy were started by the Lundy Field Society in 1947 when (amongst others) 20 Manx Shearwaters and 12 juvenile Shags were ringed. If you are interested in doing research on Lundy, or have any questions about seabird research on the island, please contact the Warden. This list is taken from Davis & Jones (2007) "The Birds of Lundy"
Organisations Lundy is owned by the National Trust and run by the Landmark Trust. Accommodation lists from the Landmark Trust website.